Shayne Rea struggled on his path to Eugene, Ore., but he got there - as a top pick of the Royals, according to The Eugene Register-Guard. A top player early in high school, problems at home prompted him to drop out, The Register-Guard wrote. But he still managed to finish school and play college ball. He played it well enough for Kansas City to make him a third-round selection. "Tears of joy," Rea told The Register-Guard of his reaction to being drafted. "I was someone who had it all, gave up on himself and then turned it all around." Rea's career - and life- would take even more turns, one bad and one awful. Injuries provided the bad turn. They helped end his career after just four seasons. He never made AA. The awful one came in July 1994, when Rea, then the father of a 10-month-old girl but wracked by depression, ended his own life. He was 23. Rea was taken by the Royals in the third round of that 1990 draft, the club's first overall pick, out of Henry Ford Community College in Michigan. He started with the Royals at Eugene. Before his first start he told The Register-Guard his excitement. "I've been dreaming about this," Rea told The Register-Guard. "When they put the ball in my hand, things are going to come alive." In his first start, Rea went three innings and gave up two earned runs. Overall, he got into nine games and started six. He went 2-4, with a 5.28 ERA. 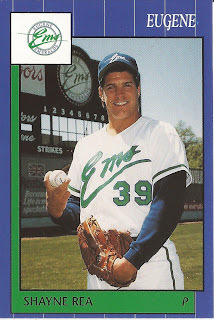 He moved to single-A Appleton for 1991. He went 7-11 there, with a 5.13 ERA over 27 starts. He returned to Appleton for 1992. In 38 mostly relief outings, he picked up nine wins and a 2.61 ERA. Then came his injuries to his back and wrist. He saw 17 outings in 1993 between high-A Wilmington and the rookie Gulf Coast League, then the Royals gave him his release, ending his career. Rea then returned home and started speaking to high school students about his upbringing - one that included substance abuse - in motivational speeches. Years later, Rea family members spoke to The Oakland Press for a series on suicide. "It's not something you talk much about," brother Chad Rae told The Press in 2015. "Especially back then. But I can tell you this, there isn't a day that goes by when I don't think about my brother and how much I miss him."